Poundworld-owned variety retailer Discount UK has opened its Newcastle store today, with stilt walkers and free sweets on hand to welcome shoppers to the former Woolworths site. I dropped by shortly after the store opened at 10am, and it seemed to have got off to a good start – it was packed with shoppers, and there were plenty of people queueing at the tills to make their purchases. Inside, the store has retained the old Woolies wooden flooring, but otherwise looks to have had a comprehensive refurbishment. It also seems to have used the bulk of the space that Woolworths previously occupied, making it rather larger than the existing Discount UK store in Middlesbrough. 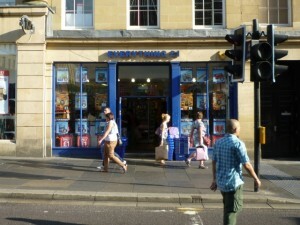 Externally, the store has gained some smart and bright signage that is an undoubted improvement on what it replaced. 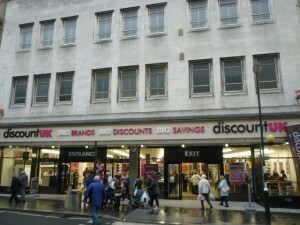 While Discount UK was making a concerted effort to drive shoppers into its store – with leafletters handing out offers flyers across the city centre – I couldn’t help but notice the staff and security guards in Poundstretcher opposite, looking out the window at all the activity across the street. 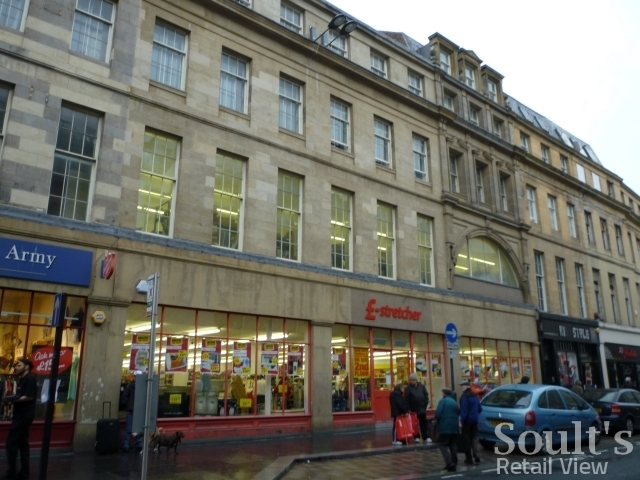 Newcastle’s Poundstretcher has the advantage of being housed in a handsome Grade II-Listed Richard Grainger building dating from 1837, with two decent-sized trading floors. 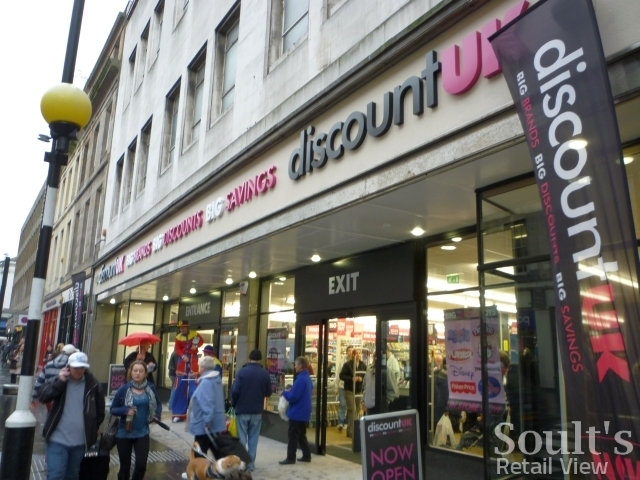 While the ground floor features all the traditional Poundstretcher ranges, such as snacks, greetings cards, stationery, hardware and gardening, the upper level includes an usually extensive range of furniture and homewares. Like most Poundstretcher stores, however, the quality of the goods sold is far superior to the cluttered and neglected environment in which they’re presented. The dreary advertising board that Poundstretcher had outside its store today is illustrative of the retailer’s presentational problems. 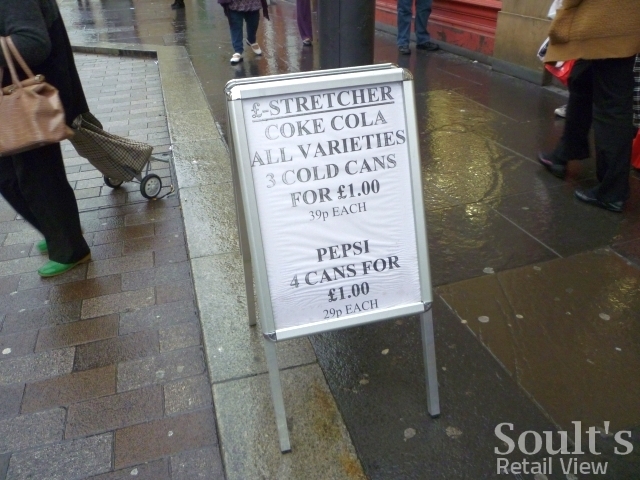 With faded black Times New Roman lettering on a white background, it’s the type of point-of-sale advertising that would look unprofessional even for a corner shop – yet Poundstretcher is an expanding chain, with over 350 stores nationwide. Surely it could have done something more creative and eyecatching to capitalise on all the buzz and extra footfall being generated over the road? As I’ve argued before, Discount UK’s arrival will be positive for Clayton Street in bringing some life back to the location, and helping to cement its appeal as a value retail destination. 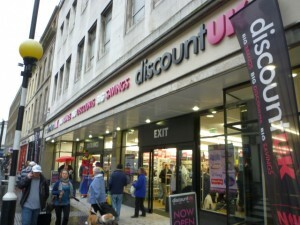 Indeed, rather than Discount UK being a threat to Poundstretcher, the shot in the arm that it will give to Clayton Street should be seen as a great opportunity. For all that Discount UK is a multi-price fascia, the fact still remains that 80% of its product range comprises items costing £1 or less. 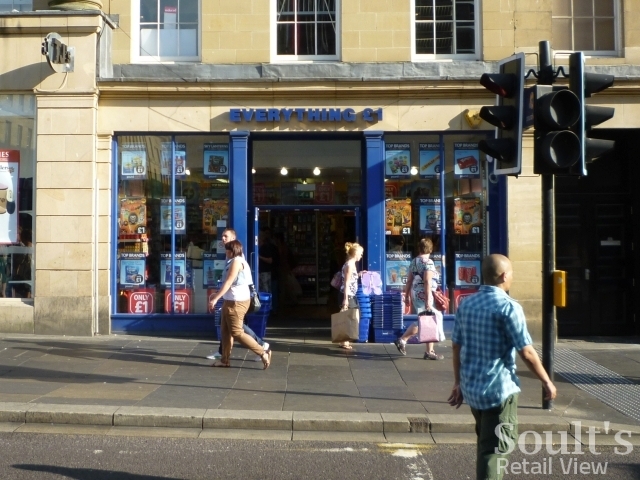 In this regard, it is competing much more with the two Poundland stores in Eldon Square, and with Poundworld’s eponymous shop in Grainger Street, rather than with Poundstretcher, where the average item price is undoubtedly much higher. If I ran Poundstretcher, I’d be seizing the opportunity to revamp the Newcastle store as a flagship for the chain – investing in (and – crucially – maintaining) a cleaner brighter interior that matches the quality of the product; creating a clear visual identity for the store, inside and out – including the latest logo on the fascia; and sorting out the clutter by trimming the range and selling fewer products better. 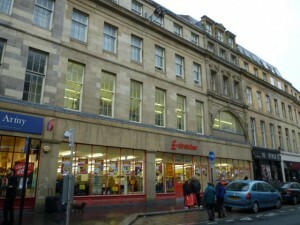 Despite its name, and the tagline of “the original value store”, Poundstretcher isn’t and never has been a pound store – it’s a brand that should be able to compete with chains like Wilkinson, Cargo, Argos and the big supermarkets, based on the quality, range and value of its home and garden products. 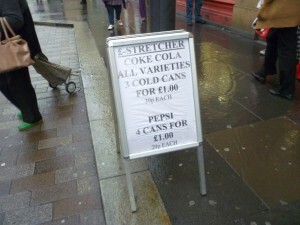 If Poundstretcher is to build on the momentum of recently making its first (albeit modest) profit in six years, this is surely the direction in which it needs to head – rather than competing with the discounters to see who can sell the most cans of Pepsi for £1.